Does This Magnifier Stand REALLY Work? USee Tablet Stand Review! 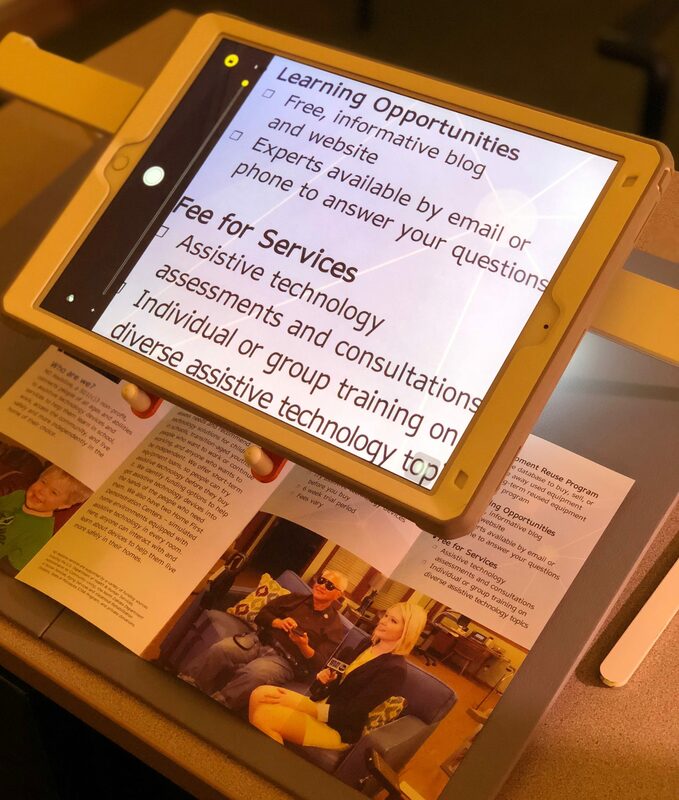 More and more people with low vision are embracing assistive technology to stay as independent as possible. Did you know that often times those individuals use their smartphones and tablets to magnify what they are trying to read? Yes! 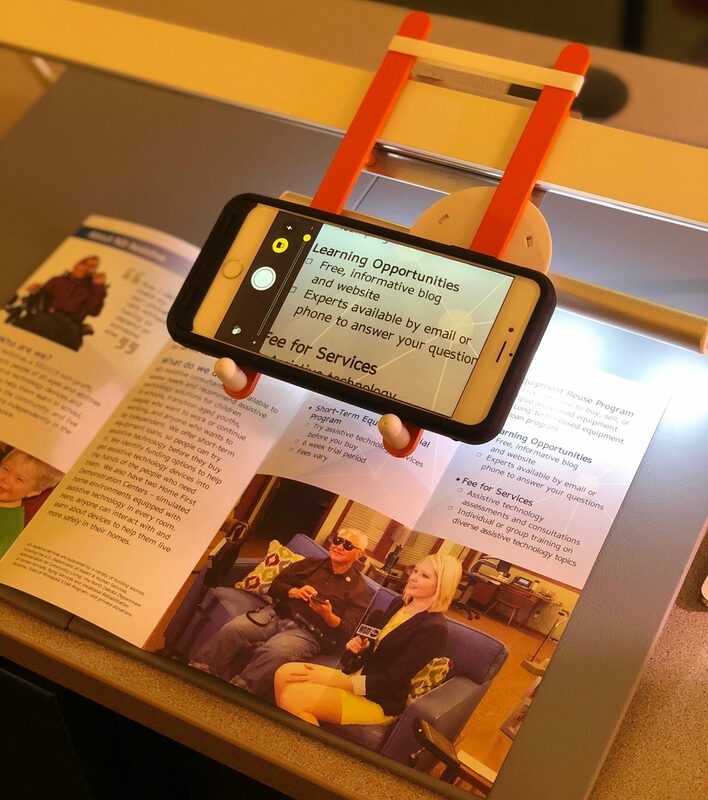 Devices like smartphones and tablets are multipurpose, easy to transport, and provide more reading space, clarity, and magnification compared to their handheld magnifier counterparts. 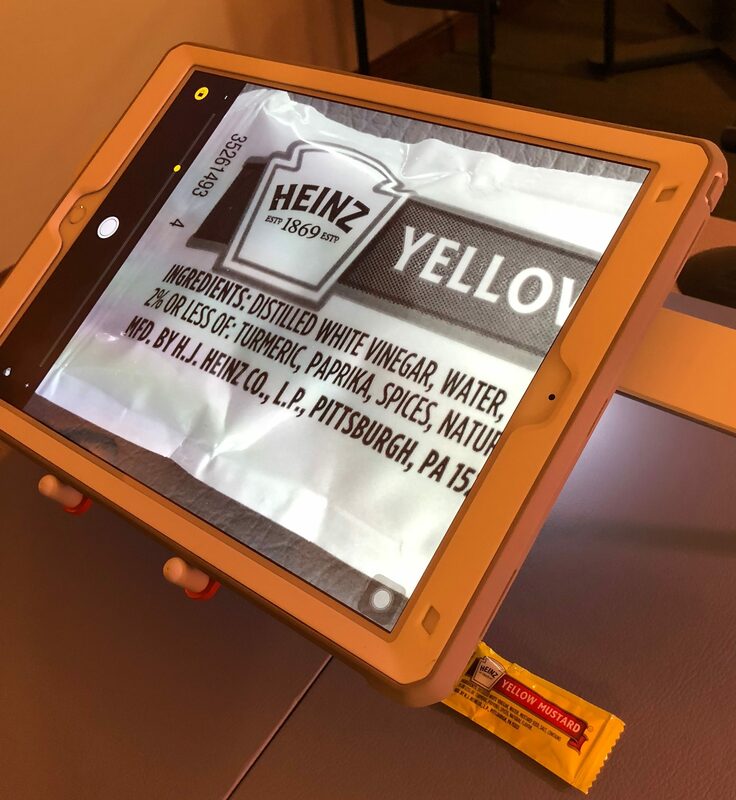 There are several ways to use a smartphone or tablet like a handheld or desktop digital magnifier. (Check out what I mean HERE.) These solutions are great. Especially when users are on the go reading things like menus, price tags, ingredients, and more. However, for tasks like reading a manual, book, or recipe most people prefer to use their device comfortably sitting down. Holding a smartphone or tablet for a long duration of time can be hard work. Imagine using your phone’s camera to read your favorite book. After a while your arms would become shaky, your eyes would fatigue, and you would be frustrated! That’s why we’re always on the look-out for well made, low cost, easy-to-use tablet holders. What is the USee Tablet Stand? This document viewer 2.0 uses your tablet or smartphone as a smart reading aid! This stand allows a user to position the tablet or smartphone over printed material at a suitable height and angle and keep their hands free while reading magnified print. The tablet’s rear-facing camera is used as the magnifier and a linear slide is used for smooth positioning of the tablet. The product is offered as a full set, including a reading plate and magnetic LED-light. Suitably positioned in local libraries, schools or in the home. This can be utilized by anyone with a visual impairment to help gain access to printed materials independently. The product’s design is sleek, simple, easy to put together, and use. The product is relatively compact and lightweight. It could be easily transported between home, work, and school. It is made out of durable materials. Mostly metal and little plastic. The slider component glides with ease. I was pleasantly surprised. 6. It comes with a magnetic LED light that can be attached to any metal part of the device. The price. At $100 the USee tablet magnifier is cheaper than similar products – but still, $100 is expensive for some. I was hoping it would be in the $55 – $65 price range. Getting used to where the camera lens is. This really has nothing to do with the product’s design, but I thought it should be mentioned. Most smartphone and tablet cameras are located in the corner of the device. It takes practice to align the text you want to read with the camera lens. I could see this as a huge frustration for some. Correctly moving what you’re trying to read underneath the camera lens. Again, this is a tricky problem to solve but should be taken into consideration before purchasing the device. 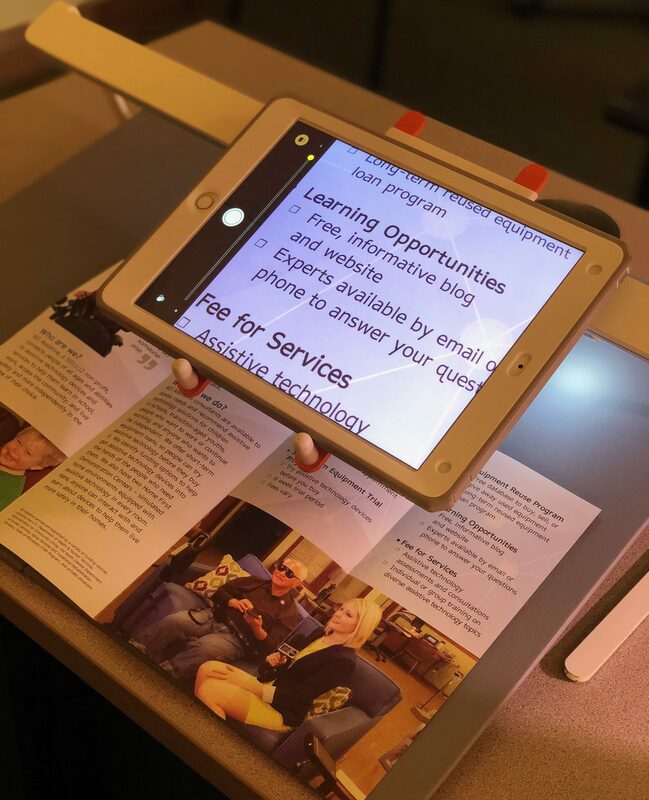 Desktop digital magnifiers have gliding boards users can easily maneuver what they are trying to read under a centralized camera lens. On the other hand, USee users need to push the text they are trying to read across the board provided. This takes practice. 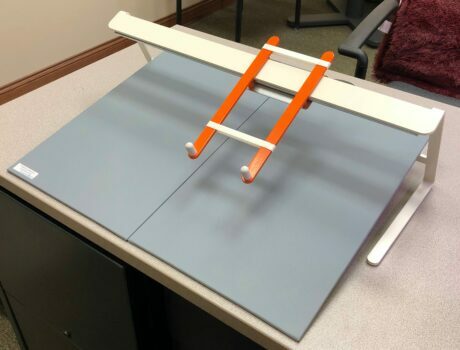 Therapy Box, the manufacturer of the USee tablet stand discontinued the product from their supplier. However, you can still purchase the device from other vendors such as The Low Vision Store.